By Liz Dow, GIS Manager, KaBOOM! 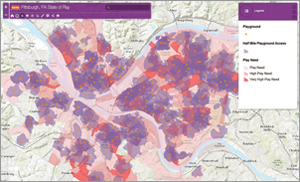 Play deserts in Pittsburgh, Pennsylvania, are shown as dark red areas that represent high concentrations of low-income children who are not within walking distance to a play opportunity. KaBOOM!, a national nonprofit founded in 1996, is trying to improve access to play areas for children in America by collaborating with cities and providing them with data and mapping solutions so they can create a more playable future for all kids. Whether it's on sidewalks, in school yards, at parks, or on playgrounds—play is a powerful thing. Play can transform a child from sedentary to physically active, from bored to mentally active, and from solitary to socially active. Today, kids are less active than any other generation, simply because they have fewer opportunities to play. Although only one in four children gets the 60 minutes of daily active play recommended by the Centers for Disease Control and Prevention, they spend almost eight hours in front of a screen according to a 2010 Kaiser Foundation study. Results of a 2009 Harris Interactive poll conducted for KaBOOM! found that across the United States, 69 percent of low-income parents reported there is no playground in the neighborhood where they live. In neighborhoods without parks, kids are 26 percent more likely to be obese. These findings were reported in "Neighborhood Socioeconomic Conditions, Built Environments, and Childhood Obesity" by Gopal K. Singh, Mohammad Siahpush, and Michael D. Kogan, an article published in the March 2010 issue of Health Affairs. Far too many of today's kids, especially the 16 million growing up in poverty in America [US Census Bureau statistics], aren't getting the balanced and active play they need to thrive. Because the well-being of society begins with the well-being of its children, KaBOOM! has a mission to bring balanced and active play into the daily lives of all children. KaBOOM! began partnering with city leaders to develop data-driven solutions that increase playability. Playability refers to the extent to which a city makes it easy for children to get balanced and active play. Through Playful City USA, a national recognition program led by KaBOOM!, cities and towns are honored for making play a priority by creating more playable, family friendly cities. KaBOOM! provides Playful City USA cities with play desert maps, a tool that helps identify areas where low-income children do not have opportunities to play. Play desert maps were inspired by the United States Department of Agriculture (USDA) food deserts maps. [Food deserts are urban areas with little or no access to nutritious foods. For information on mapping food deserts, see "Mapping Nutritional Terrain: Identifying food deserts in Lansing, Michigan" in the Fall 2010 issue of ArcUser magazine.] 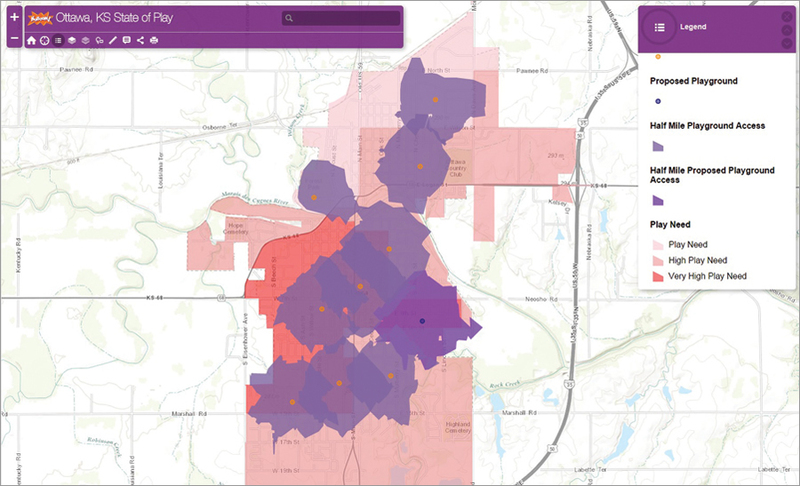 A play desert map analyzes child and low-income populations, available play spaces, and the walkable area around the play space. A playground proposed to meet the need for play space in Ottawa, Kansas. Mapping play deserts begins with data collection from the KaBOOM! crowdsourced play space mapping website called the Map of Play. On this site, anyone from residents to visitors can map, rate, and comment on play spaces in a community. They can also use the site to locate places to play in neighborhoods in a community. With this data, KaBOOM! uses ArcGIS for Desktop to capture play space entrance points and generate walkable service areas. The analysis creates walkable polygons that follow the road network but take barriers, like highways, that affect walkability into account. Areas where people cannot walk to a play space are prioritized by the concentration of low-income children in the area. Esri demographic data is used to identify these areas. Play desert maps are a tool for benchmarking a city's progress toward increasing playability and help bring play opportunities to those neighborhoods. In 2013, the first play desert maps were presented to Playful City USA cities that were attending the first annual Playful Leaders' Summit in Baltimore, Maryland. At this conference, experts and city leaders worked together developing actionable plans to drive change in cities using play. KaBOOM! staff helped cities understand the data presented in the play desert maps that were shared using ArcGIS Online. KaBOOM! quickly uploaded and edited data in ArcGIS Online and transformed play desert maps from static images into interactive tools that allowed attendees to better see and interpret data. Staff demonstrated the value of these maps in supporting a city's plans to increase playability. 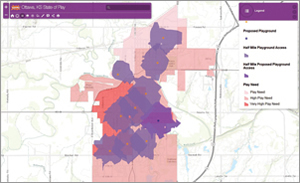 Using these maps, several cities have begun making data-driven decisions to increase playability in their communities. Ottawa, Kansas, has been a Playful City USA community since 2010. After receiving an online play desert map of Ottawa in 2013, the Ottawa Play Task Force used it to analyze and prioritize gaps in the city's amenities. Prior to receiving the play desert map, the task force had been focused on new and replacement projects and had not considered the locations of Ottawa's parks. The Play Task Force has since incorporated the play desert map into the park master plan and has used this data to plan for three additional play spaces. As a channel to share successes with funders and apply for grants, Ottawa's play desert map has become a useful tool for setting goals and illustrating the need for play areas to potential funders. A child care facility study in Pittsburgh, Pennsylvania, identified areas with high capacity child care facilities that were not within walking distance of a play space. Pittsburgh, Pennsylvania, a Playful City USA community since 2011, also received its online play desert map in 2013. The Playful Pittsburgh Collaborative, a group of committed individuals and organizations working to prioritize play in Pittsburgh, worked with KaBOOM! to learn more about play opportunities in Pittsburgh. In addition to a traditional play desert map that focuses on play spaces, the collaborative also requested an analysis of child care facility locations to examine the play opportunities available to children during the day. The child care analysis examined each facility's capacity for children, its quality, and whether it was within walking distance of a play space. The collaborative used the map to start conversations with child care providers and city personnel to begin the process of bringing outdoor play spaces to downtown Pittsburgh and other areas in need. Twelve Playful City USA communities at the vanguard of the national playability movement received play desert maps in 2014 when they attended the Second Annual Playful City USA Leaders' Summit in Chicago, Illinois. KaBOOM! continues working with cities to develop actionable solutions that enhance playability. The organization sees play desert maps as valuable tools that will help cities make data-driven decisions for building a more playable future in America. For more information on mapping play, contact KaBOOM! GIS manager Liz Dow.